A reluctant but energetic America entered the fighting in 1917. We sent our sons. We rationed our bread. We stopped wearing corsets to save the steel for warships…and we wrote and sang the songs that rallied the troops. The music, food, patriotic pastimes and tragic losses were things that every American family knew. This war ushered in what came to be known as The American Century. What did it feel, sound and taste like to be there? During the Sycamore History Museum’s Winter Fund Raiser on February 16, Ellie Carlson has one foot firmly planted in the early twentieth century. 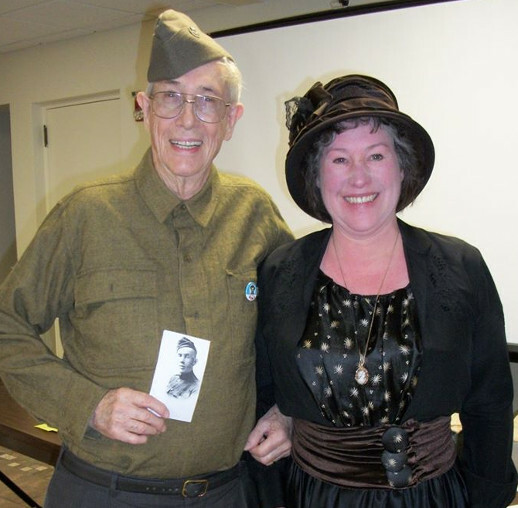 Throughout the program, “A Hundred Years Ago On the Homefront: How Families Faced The War to End All Wars” she will transport the audience there with the sights, sounds and tastes of the era. If you know nothing of World War I, come to learn. If you had relatives and friends who were there, come to be reminded. Learn the history, sing the songs, taste the food. Travel back in time to the Homefront. Have real-life time capsule opening experience. The evening will include period food, silent auction, and cash bar. Doors open at 6:30 and the program begins at 7:00 at St. Mary’s Memorial Hall, 322 Waterman St. in Sycamore. This evening is sponsored by First Midwest bank, IDEAL Industries, Taxco and Banner-up. Respondents not only discussed this impulse to document the past, they also talked about their efforts to preserve pieces of it. They said they turned photo albums and diaries into treasured artifacts passed from one generation to the next.